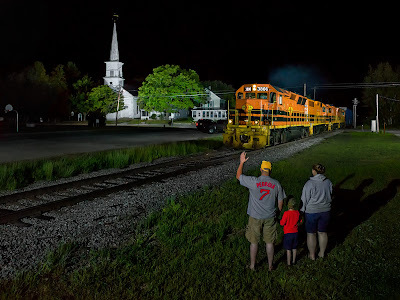 I was approached by NECR engineer/conductor Ed Ferguson earlier this year about the chances of meeting me during the summer sometime, in Gorham, NH, to take a night photo of Eds family with SLR train 393 coming by. I of course, said sure! Knowing of the increased appeal that having people in night photos of trains brings. We settled on last Friday evening to meet and the scene with the church for the composition. 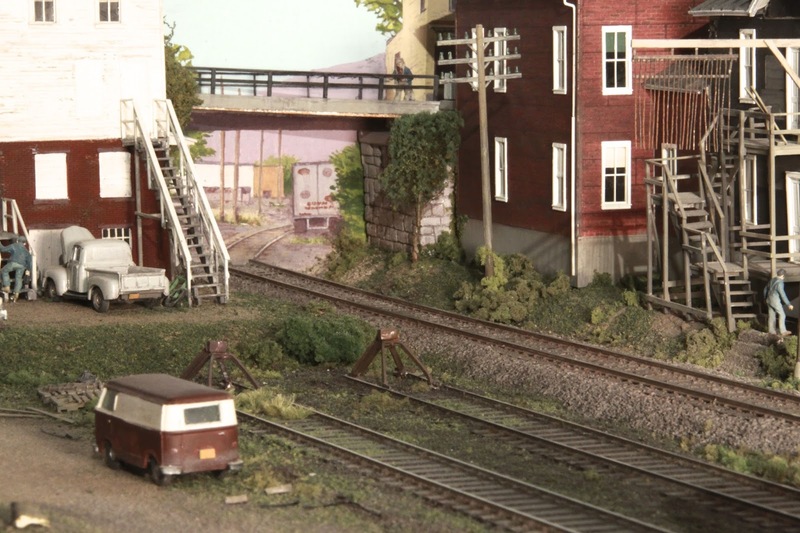 A classic New England scene, only available to be enjoyed with a train during the four nights a week the Saint Lawrence & Atlantic (SLR) operates presently. I had shot the scene a few times before with the late Don Provencher and friends posing, so I was comfortable with what I was getting into. I invited Dons sister Linda to stop by and say hello, (she could not make it) and............I invited Lin and Hugh Chapman from over in Gilead, Maine, with the understanding beforehand that it was to be a family portrait for Ed. Inviting Lin and Hugh turned out to be a stroke of good fortune! The big unknown in the days leading up to Friday was what time? My previous week spent on the west end of the SLR in Island Pond at Lakeside Camping had seen 394 departing later than normal from town, once after 2300. They exchanged trains with 394s crew in Berlin, NH around 0200 to 0300. The Chapmans, who live trackside in Gilead reported hearing 393 going by recently between 2330ish and midnight thirty! I suggested to Ed and The Chapmans that we meet at 2200, thinking it better to be safe and hang around waiting, than late and get no photo at all. So I came rolling into downtown Gorham around 2130, happily noticing the temp readout at a bank of 69 degrees, pulled to a stop at the town green and began to set up the lighting for the church and house. I was soon joined by Ed, Sarah and four years young Ed Jr. (EJ) and we exchanged greetings. EJ was full of energy, seeing me again he knew the orange train was coming! LOL! Ed and Sarah corralled EJ while I finished setting up a flash unit, then we moved over across the tracks to where we would shoot the photo. I was halfway through setting up the lighting for the train when the Chapmans arrived, and they brought news! Lins brother had been recruited to be the lookout for us and he had just called to say 393 was going through Gilead at that time! Earlier than expected! How out of character for the railroad. Ten pm was looking like a good time to meet. Lin and Hugh get another Gold Star for driving over with such timely train info! We figured Gilead to be around thirty minutes away by train so we were all happy at the prospect of 393 coming by before midnight. Fifteen min. later found everyone in their places! Gary atop the stepladder, Ed, Sarah and EJ down below me on the lawn and Lin and Hugh Chapman standing off to the side (happy to be watching and not posing?). Several minutes pass by as I tweaked the flash units and moved Ed, Sarah and EJ around, then we waited, shootin’ the breeze until 393s locomotives could be heard just before the engineer began whistling for the first grade crossing coming into town. 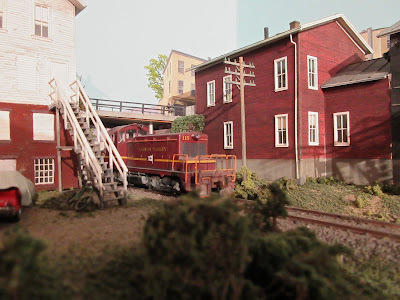 Once over the grade crossing, 393 heads up tangent track which brings them through our set up by the church, and I fire off an awareness flash of the lights for the crew. I get a couple toots acknowledging they saw it. A mass of headlights appear coming up to Glen Road crossing just below us, dissolving into the triangle shape of locomotive headlights and the shape of a cab emerging from the darkness. Spellbinding to watch at night, as the locomotives complete this beautiful New England landscape! Once over Glen Road crossing the leaders pilot plow comes into position and the lighting flashes out, reflecting back.........success! Then the engines are rolling past me at maybe twenty to thirty mph. A short consist follows then silence slowly returns. Only in examining the photo afterwards does Ed point out how both of the SLRs (rare) GP 40Xs were in the engine consist! 3806 leading with 3805 trailing! Shot in Gorham, NH on July 29, 2016 at 22:32. Special thanks to all involved! Please enjoy! Comments are welcomed. One of the new locations I got to enjoy while staying with my sister in Wells, Maine was the station on Pan Am in nearby Kennebunk. Built in 1872, an example of “stick style” architecture, there are plans in the works for converting the west end of the building into a stop on Amtraks Downeaster route. Hopefully Amtrak will not get carried away modernizing/scarring the building and surroundings. Westport, NY comes to mind with its Amtrak wheelchair lift storage shed installed at the north end of the platform. One good thing here is the building already is equipped with an elevated platform of sorts! 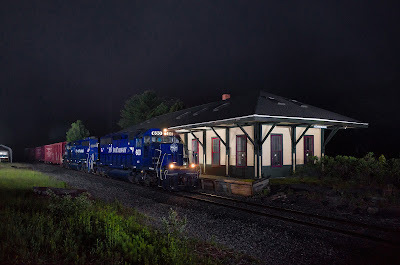 For now, Kennebunk station makes a wonderful location for shooting eastbound Pan Am freights, and on slow nights even Amtrak Downeasters cruising past! Unfortunately, the west end of the station lacks a “Kennebunk” station sign at present, making it less appealing for night photos of westbounds. I am not knowledgeable about traffic yet, relying on friends in the area as to what to expect. The trains to and from CSXTs Selkirk Yard from Portland I saw each of three nights I shot here but no eastbound Pan Am freights. Until tonight! This time of year, I take my chances with the shortest nights to shoot in. Unless it is overcast, the “dreaded dawn effect” is evident around 04:30! My last night here for this visit, a saturday night, I enjoyed lobstah for dinner, my sister treated, then came up here, a mere five miles from Wells, determined to at least give my specialty at night a try, the “all night stakeout” (a.k.a. stare down with the railroad) hoping to get a chance at a passing Pan Am freight. Arriving at nine pm, an extra Downeaster move went past as I set up, then silence until around 01:00 when a scheduled Downeaster sped past. Around 3 a.m. 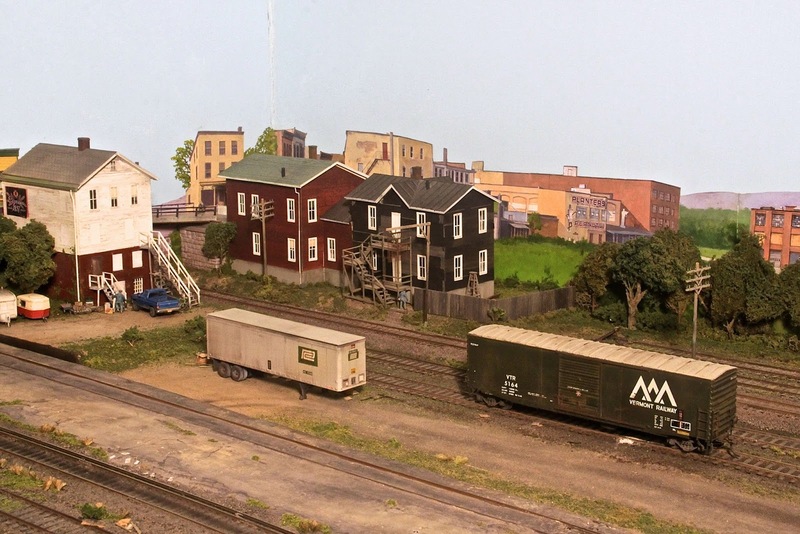 I got a call from Brian Jennison west of me in Newmarket, NH telling of an eastbound Pan Am freight spotted going past his house! At the time we talked the signal west of my location had been green for a while and I was ready to shoot what turned out to be a long Pan Am POED (Portland to East Deerfield). Afterwards, as I happily went about relocating the lights for the eastbound Brian reported, the unknown was “IF” the e.b. would be held up meeting POED long enough to pass by too late, after dawn? Happily, as you can see in the attached photo, the eastbound delivered success! The fog delayed the brightening of the sky which helped. Not knowing what to expect for a leader, I was hoping for one of Pan Ams group of SD 40-2s. 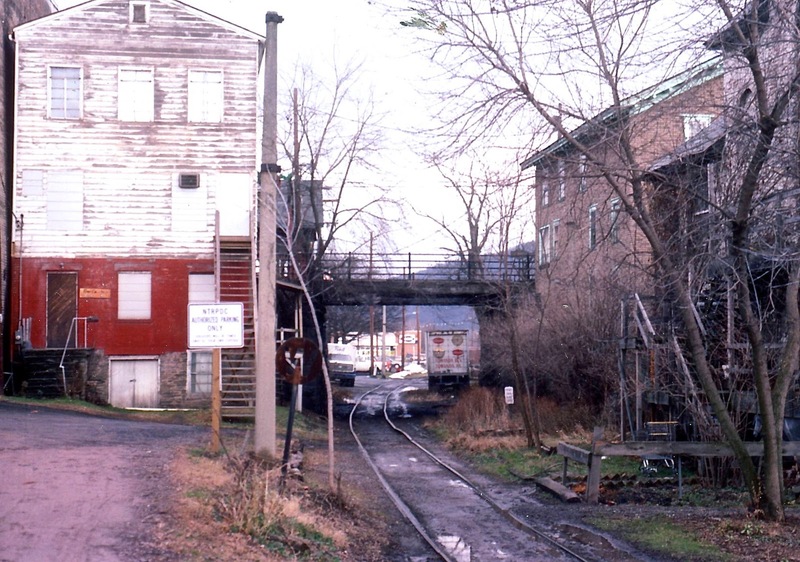 Standing next to the stepladder, it was quiet enough to allow me to hear the train blowing for the crossing five miles away in Wells. The engineer was accelerating out of Wells, I listened to the EMDs through a muffling highway overpass, out the near side then he throttled back and silence returned. Up atop the stepladder I was smiling to myself, thinking how of course the westbound must have mentioned to the crew of a night photo up at Kennebunk when they met earlier! These guys are coming in in “stealth mode”! At night, trains can be amazingly silent, foggy conditions like tonight muffle train noise even more it seems. Looking down the tracks, time seems to stop. A minute passes perhaps before headlight glow can be discerned in the fog, I fire off the lighting for the crews benefit, then a mass of light appears, becomes the triangle shape of headlights and ditchlights, and I watch as the shape of the leader comes into the scene out of the haze, glancing at the number board, see “600”! Idling along at track speed, maybe forty mph, 600s nose passes my mark and the lighting, with the GR, captures the moment! Then the head end glides past with a short consist, minutes ahead of dawn. That was worth waiting for! I hope you agree. Cloud nine stuff for me! Afterwards I met Gordon Collins, who lives up the street from the station, out walking his lab “Trapper”, and we had a pleasant conversation. Gordon thought, not knowing what I was up to, that I might have been surveying for Amtrak, and contributed as to how plans were to convert a portion of the station into a stop for the Downeasters. He was more interested upon learning I was taking train photos with flash units to share with others, and he now joins you on this list! Welcome Gordon! Shot in Kennebunk, Maine on June 5, 2016 at 04:21. Special thanks to Brian Jennison, for getting out of bed at 3 a.m. in time to confirm the passing train was an eastbound! Please enjoy! Comments are welcomed.